This Palm Island review was made after playing the game about 12 times. We were sent a copy of this game by the publisher in exchange for an honest review. 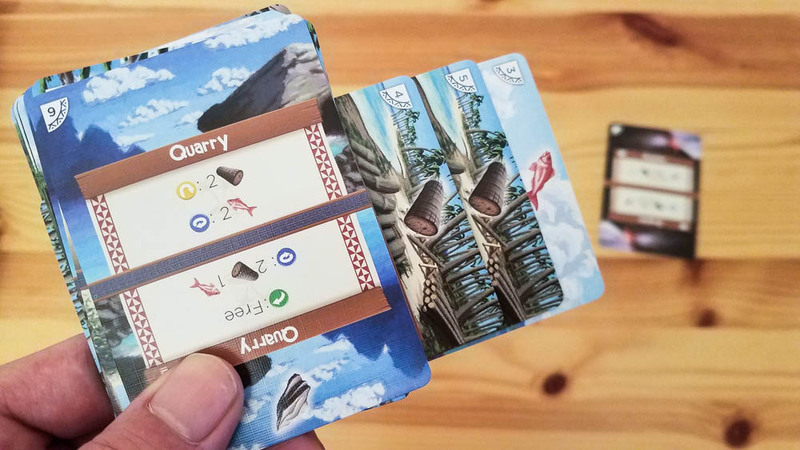 Palm Island is a unique resource management card game from Jon Mietling and Portal Dragon in which you’re attempting to use your cards to upgrade your island and get as many points as you can. You don’t need a table to play it as the entire game is a 17-card deck that can be played in two hands. The game has solo, cooperative, and competitive modes. Each card in Palm Island has four states: the top and bottom of the front of the card, and the top and bottom of the back of the card. You’ll be attempting to upgrade your cards to higher levels throughout the game so you can maximize your points. For example, you’ll need one fish and one log to upgrade your Housing the first time. To begin a game, you’ll shuffle up the cards and then place the round tracker card at the back. Each turn, you can look at the top three cards in the deck and take an action with one of the top two cards. If you can’t or don’t want to take an action, you’ll discard the top card (send it to the back of the deck). When you do take an action, you’ll rotate or flip the card and place it at the back of the deck. Store – Rotate the card 90 degrees and move it to the back of the deck so you can use its resources on future turns. Some cards have free Store actions while others will cost resources. You can store up to four cards. Rotate – Pay the card’s resource cost, rotate it 180 degrees, and move it to the back of the deck. This usually gives you an upgraded version of the card to use in future rounds. Flip – Pay the card’s resource cost, flip it to its other side, and move it to the back of the deck. If you perform an action that costs resources, you simple rotate those resources 90 degrees counterclockwise. The round ends when the round tracker card makes it to the front of the deck. At that point you just rotate that card and continue playing. After you’ve gone through eight rounds, you’ll count up your stars and look at the score chart to see how well you did. The key to the game is figuring out when to use your resources. You’ll want to upgrade resource cards to give you a better mix of resources in future rounds, but you’ll also have to figure out when you should upgrade the big point cards. If you’re playing the solo game, you can look through the Feat cards at the end of each game to see if you unlocked any cards. Unlocked Feat cards can be added to your deck in future games, giving you new special abilities. In the two-player cooperative game, you’ll be attempting to avert disasters while also trying to get a good score. You’ll choose one of the three Disaster cards at the beginning of the game and will need to collectively use some of your resources to deal with it before the end of the game. There are also Ability cards that can be added to the cooperative game that, when activated, will give both players special abilities. The two competitive modes (Casual and Speed) add in Outpost and/or Villager cards that will give you new ways to gain resources and score points. That is just a basic overview of the rules. Check out the official Palm Island rulebook at BGG for more info on how to play the game. Check out our Top 10 Games of 2018! 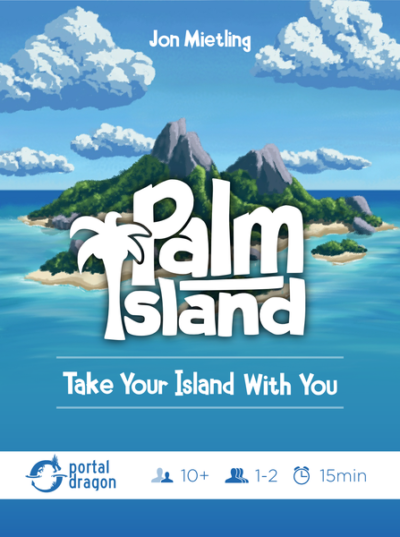 Palm Island is extremely easy to learn and teach. There are only three resources in the game and only three actions that you can take each turn, so just about anyone can learn how to play this one. The fact that you shuffle the cards means that you will be playing a slightly different game every time. It’s actually pretty exciting looking through the deck at the beginning of the game and trying to see how you can use your resources to upgrade the cards. The game works well in all modes. They all play pretty much the same way, but those Feat cards and the competitive cards do help to keep the game feeling fresh. Cooperative mode is also very cool because you need to work together to figure out how you can upgrade your decks while also dealing with the disaster. This is one of the most portable games that you’ll find. You don’t need a table, so you can play it just about anywhere. This is the first card game that I’ve been able to play while laying on my couch. I really like the overall look of the game. It’s clean and bright. It only takes 10-15 minutes to play yet it feels like a lot happens in those eight rounds. I think it’s pretty cool that there are two identical decks in the box. You can give one of the decks to someone else so they can play or practice on their own. It’s kind of like you’re getting two copies of the base game in the box. Holding the deck and moving the cards around takes some getting used to. It’s especially challenging when you have four cards stored and need to rotate one of those cards. If you happen to drop a card, you might have a tough time figuring out where it’s supposed to go and how it’s supposed to be rotated. It feels like you have a pretty low chance of getting a high score when those early free resources are stuck at the back of the deck. That’s not a problem if you keep track of the card order every game, but it might be frustrating for some folks when they simply want to try to beat their high scores. As you’d expect from a game with so few cards, it can start to feel a bit samey after about 10 games. That’s especially true if you’re only sticking to one of the game modes. 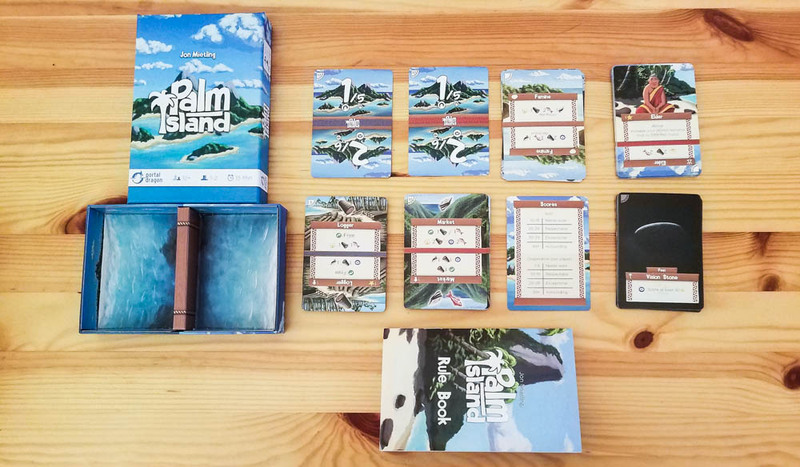 Palm Island is a unique card game that I think a lot of people will enjoy. It’s an excellent travel game since you don’t need a table to play it, and each game mode works really well. I actually like the competitive speed mode the most, but they’re all fun. I am definitely happy to own Palm Island because I now have a filler game that I can play absolutely anytime and anywhere that I want to. 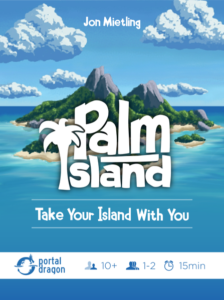 If you like going for high scores in games, you’ll probably enjoy Palm Island because it is kind of addictive in that way. If you’re looking for a game that you can take with you anywhere, yeah, get this one. Really, if the game sounds good to you, chances are you’ll end up liking it. If it doesn’t, you probably won’t. Thanks for taking the time to read our Palm Island review! To stay updated on all things cooperative board games, follow us on Twitter, Facebook, or via RSS.